If you didn't know, I am a huge fan of babywearing, so when Calin Bleu sent me one of their gauze wraps to review, I couldn't of been happier. Calin Bleu is a company based in Suffolk, England. It was established in 2005. They produce high quality, 100% cotton stetchy and woven baby wraps, as well as ring slings, bags, that are available worldwide and the best thing is they are made in the UK. I was sent one of their gauze wraps to review. The wrap itself has a RRP starting from £39, which is a very reasonable price in my opinion and if you were to buy more than one then you would save money. Available in many colours, even in a limited edition Union Jack design. I received one in the teal colourway, stunning colour that can be used for either boy or girl. Some people pick the colour of their wrap based on the gender of their child, I however pick a colour that I like regardless of gender. Made from 100% cotton gauze, the material is extremely lightweight, I would say more suitable to the Summer months because of how thin it is. It's machine washable, which is always handy when you have little ones, stains seem to appear from nowhere!! And because of how thin it is, I can tell you from first hand experience, it dries very quickly. 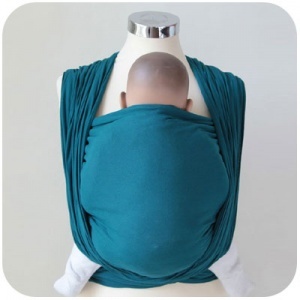 The wrap is available in two sizes, either medium or large. It is suggested that the larger wrap is more suitable for a parent that is a size16 or above. The medium is 4.6m long and the large is 5.2m long. I was sent the medium, which was more than enough wrap for me as I am only a small 5ft1' and a size10. If you were to choose size large then it adds £3 on to the price which I think is more than fair for an extra half a metre of fabric. I was pleased to see that the wrap came with a fantastic set of instructions included, showing detailed pictures on how to wrap your little ones in different carries. 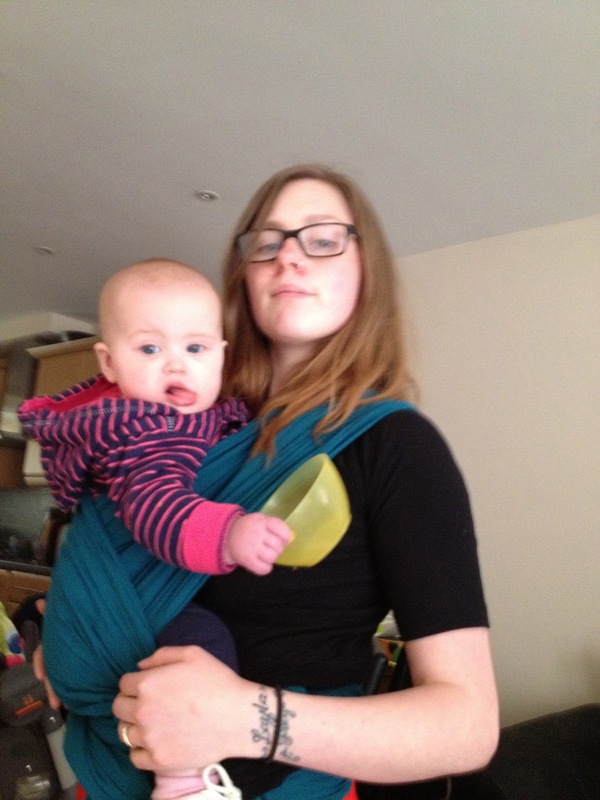 Of course to really review an item, you have to test it fully so I tried the wrap out using a variety of different carries on both my 9 month old and my 3 year old. First I tried the Front Wrap Cross Carry (FWCC). This I found very comfortable for both myself and Layla. I was able to tighten the wrap easily and keep Layla in the correct seating position. Next I tried the Hip Cross Carry (HCC). 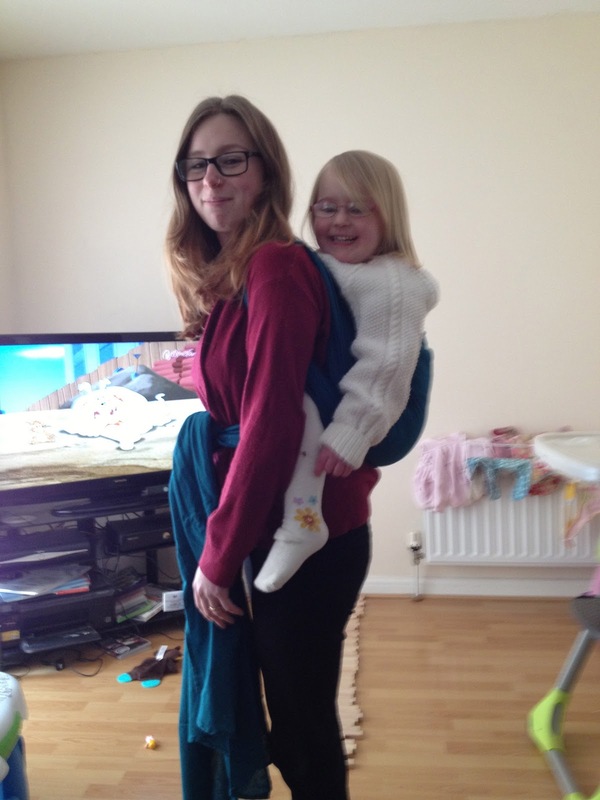 The is almost the same as the Front Cross Carry except you are placing your little one on your hip. I find this position a good one now that Layla is getting taller and a lot more nosey!! Again very easy to do, the only problem I found, was that I was left with quite a bit of fabric so I had to wrap it around my body one more time to prevent having really long tails. I like to have the wrap slightly more gathered on my shoulder but you can easily move the wrap so that it covers your shoulder too. And then it was my 3 year olds turn. We did a Ruck carry, which is a simple back carry. Gracie is quite small for a 3 year old, so I would say this wrap probably isn't as suited for an older sibling because the material becomes quite diggy with a heavier child wrapped in it. However I think with wraps it is a personal preference as what one person finds uncomfortable, another person finds the best wrap ever. These are just 3 of many other carries that you could try. I would recommend looking on places like You Tube to learn how to do the different carries, they really aren't that difficult after a bit of practice. I really love this wrap. It is a well made wrap that when worn properly, spreads the weight evenly around your back, shoulders and hips. The material is breathable, lightweight and can be folded down to be very compact. I've already decided that it will be coming on holiday with us in July!! You can find Calin Bleu on Facebook and Twitter to keep up to date with all their latest news. 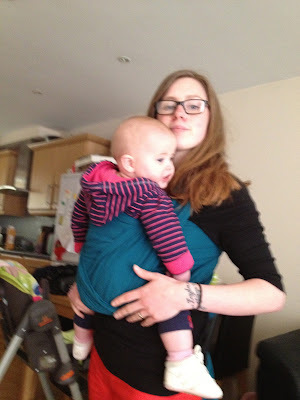 I absolutely love my Calin Bleu wrap...so light for summer yet sturdy for baby! I have a Bali Breeze now, which would you say was more comfortable?